When you no longer need an attached resource, you can detach it. This resource remains registered with the stack and can be attached elsewhere. 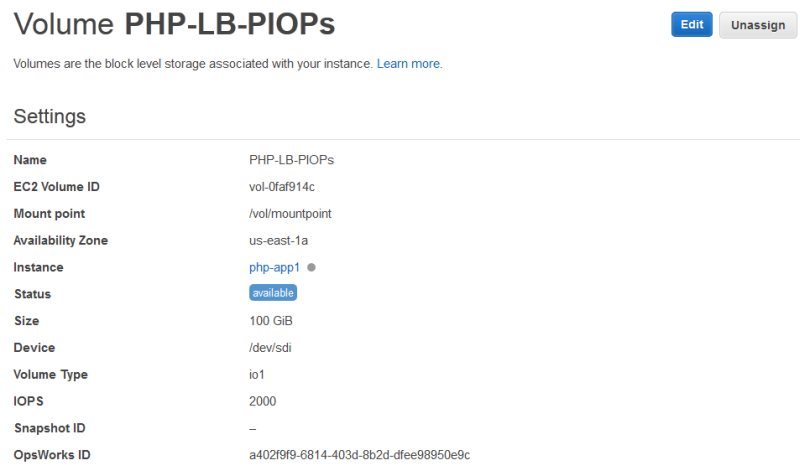 Use the following procedure to unassign an Amazon EBS volume from its instance. Ensure that the instance is in the offline state. On the Resources page, click Volumes and click volume name. On the volume's details page, click Unassign. Use the following procedure to disassociate an Elastic IP address from its instance. On the Resources page, click Elastic IPs and click edit in the address's Actions column. On the address's details page, click Disassociate. After you disassociate an address, AWS OpsWorks Stacks triggers a Configure lifecycle event to notify the stack's instances of the change. Use the following procedure to detach an Amazon RDS from an app. On the Resources page, click RDS and click the appropriate app in the Apps column. Click Edit and edit the app configuration to detach the instance. For more information, see Editing Apps. This procedure detaches an Amazon RDS from a single app. If the instance is attached to multiple apps, you must repeat this procedure for each app.